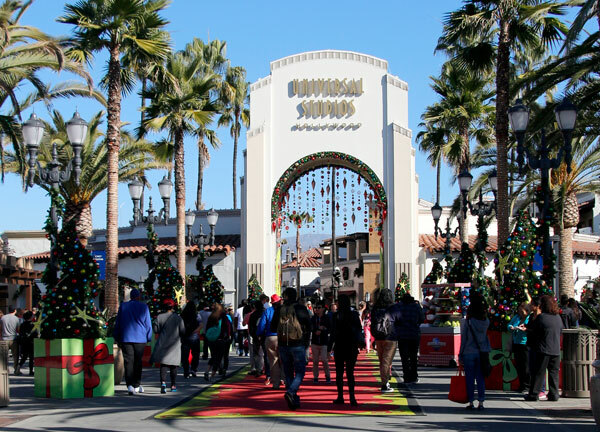 The holiday season is in full swing at Universal Studios Hollywood's GRINCHMAS celebration with the park decorated in festive holiday decorations. From the red carpet at the front gate having a nice Grinch green boarder and fancy decorated Christmas trees around the carpet, to the lights and other decorations hanging, the atmosphere is of joy and celebration. 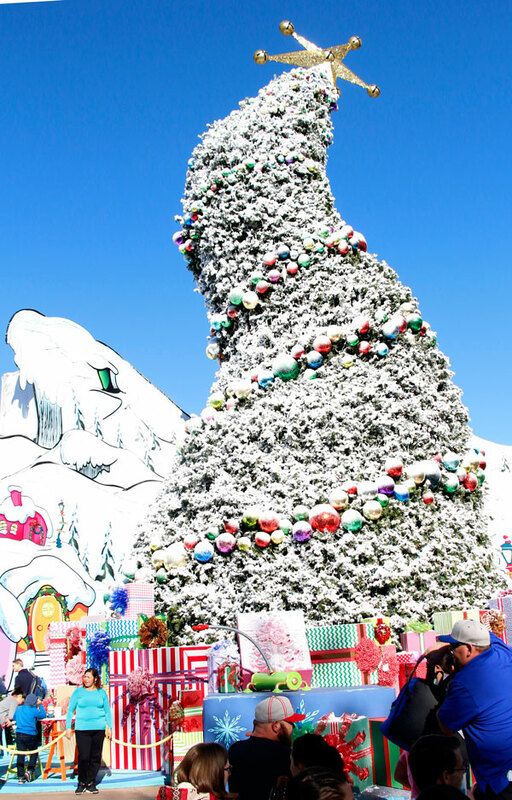 Whoville has come to the center of Universal studios with a giant tree with a stage where a show hosted by Cindy Lou Who. 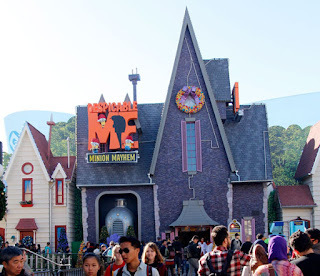 Along with a show visitors get an opportunity to take a picture with Max the dog and his single antler, have a social media post opportunity with the Grinch's sleigh and interact with other who-villians. 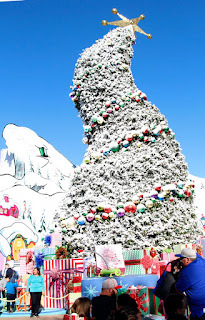 After story time with Cindy Lou Who, the Studio Tour tram leads from King kong 3-D, to the Fast and the Furious 3-D experience and over to a special Grinchmas performance at Whoville set. 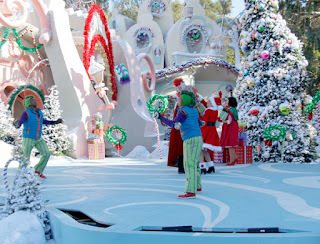 The special performance contains an appearance by the mean green Grinch. "You're a Mean One, Mr. Grinch," with some who-villians. When the grinch joins in, the festivities become more exciting. Make sure to get a seat in the second or third section of the tram as the first section really can't see much of the performance. It's a short performance, but kids are sure to get a good treat with it. The holidays get everyone in the spirit and ever the Despicable Me; Minion Mayhem house has gotten some small changes. On the outside theres a Christmas Reef and the minions are wearing Santa Claus hats. 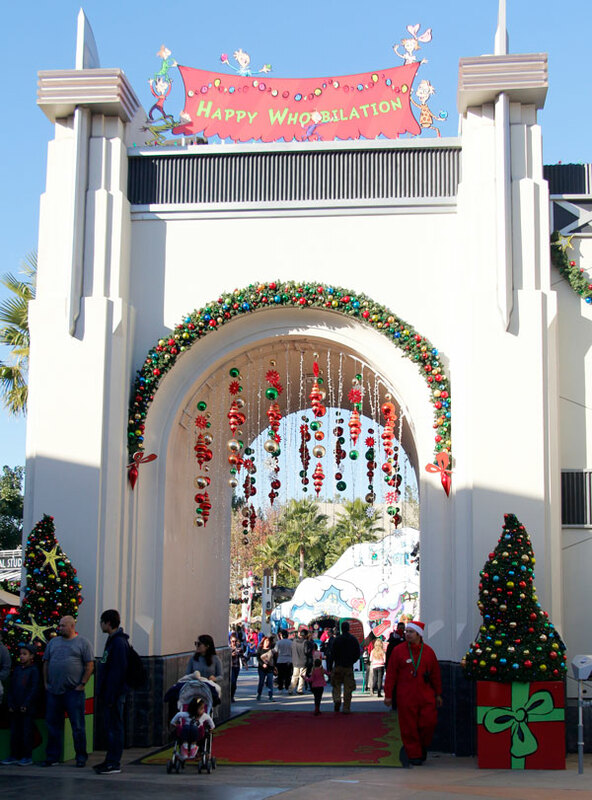 Christmas Trees and holiday decorations are set at the entrance of the virtual ride. The streets have some decorations, but the most noticeable change is just that most of the minions are wearing Santa Claus hats. Its great to see the children get excited to see the minions' new look. It's a small change, but the festive spirit is enough to be joyful for kids. On the other side of the park, The Wizarding World of Harry Potter has warm Butterbeer for the cooling temperature in Los Angeles. It's a sweet, maybe a bit too sweet, drink which has no alcohol so even kids can enjoy a warm cup of Butterbeer. There's also a slush and the regular Butterbeer available. Grinchmas at Universal Studios Hollywood isn't the only holiday treat, Universal CityWalk is also decorated and has CityWalk Holidays celebration going on. A 40-foot tall Christmas tree with 200,000 LED icicles choreographed to the lights and sounds of the season is at the 5 Towers plaza. Santa Claus will make nightly appearances and have special photo opportunities at the 5 Towers. 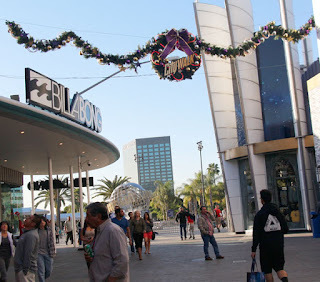 The iconic, dancing water fountain at the heart of CityWalk also will make a splash this holiday season. This modern and impressive fountain displaying more than 230 individual power jets projects streams of choreographed water into the air complemented by red and green LED lights and with holiday-themed music. CityWalk has free concerts and special appearances by Santa Claus. 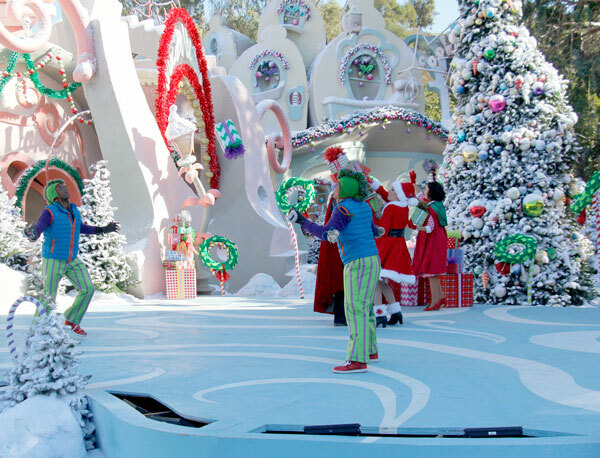 Grinchmas runs weekends on Dec. 3-4 and 10-11, and daily from December 16 through January 1, 2017.